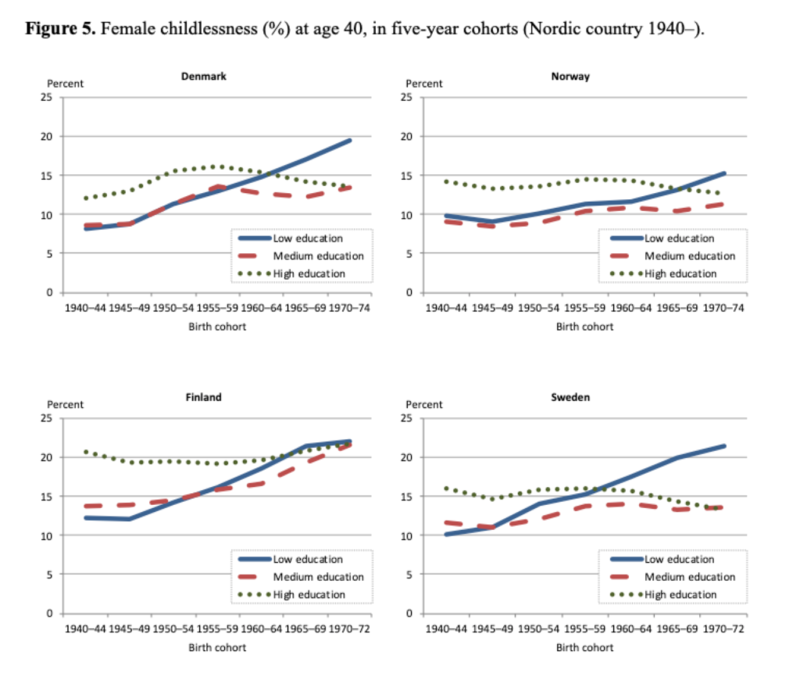 Many studies find that highly educated women have few children and high level of childlessness, but as Marika Jalovaara and colleagues show, the patterns in the Nordic countries have changed remarkably: women’s educational fertility differentials have almost disappeared and childlessness levels are now highest among low-educated women. Among men, however, a positive association between education and fertility persists. levels of ultimate childlessness, i.e. the proportion of women and men who have remained childless up to this age. We used longitudinal individual-level data drawn from the national population registers of the four Nordic countries and looked at the development of education, completed fertility and childlessness over time. 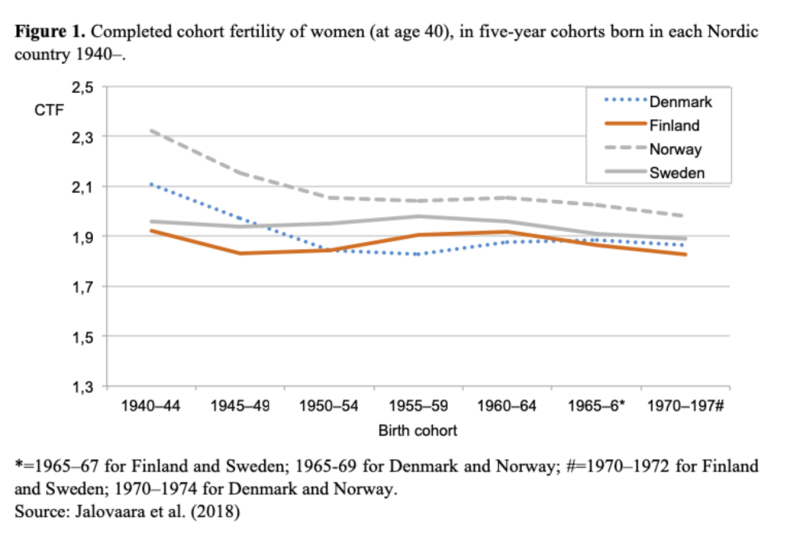 We observed fairly similar developments of completed cohort fertility in the Nordic countries. As Figure 1 shows, the CTFs of women declined slightly in the oldest cohorts, but remained fairly stable thereafter. In all four countries, CTFs stayed consistently close to the replacement level. The ‘roller-coaster’ period fertility that all Nordic countries experienced to some extent (see Figure 2) had no major effect on the CTFs. This is partly because cohort fertility is more robust to changes in the timing of childbearing; it also reflects the recuperation of fertility at older ages that is characteristic of the Nordic childbearing pattern. 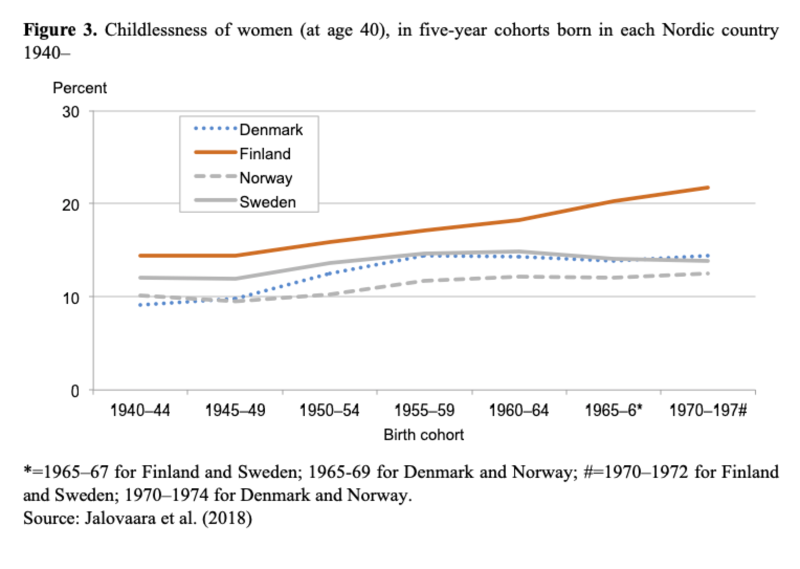 The levels of ultimate childlessness initially increased, but plateaued among the cohorts born since the late 1950s, except in Finland where childlessness continued to increase (Figure 3). In Finland, childlessness levels in the youngest cohorts are quite substantial: 22% for women and 27% for men compared to 12–14% for women and 19–24% for men in the other three countries. The overall stability and development of completed cohort fertility and of ultimate childlessness masks the remarkable changes in childbearing patterns that have occurred among women with different levels of educational attainment. These changes and the persistence of educational disparities in fertility among men have fundamentally altered the gender and social pattern of fertility and childlessness among different educational groups in the Nordic countries. To provide background for assessing the transformation of educational differentials in fertility development, we briefly describe the educational developments in each country. With the general increase in education, the numbers of men and women in the lowest-educated stratum have fallen in all four countries. Among the oldest female cohorts, 36–51% of women have only basic education; among the most recent cohort, the proportions vary between 6% and 13% (men: 11–21%). Among men, upper-secondary education is now the most common level attained, whereas among women, tertiary education has expanded substantially. Between 43% and 55% of women born in the early 1970s hold a tertiary educational degree compared to 15–21% of women born in 1940–44. Among men, the increases in high educational attainment are rather modest (+8 to 9 percentage points) or very small (+2 percentage points in Sweden). These gendered developments have led to a reversal of the educational gender gap to women’s advantage. Consistent with previous studies in Europe, we find that low-educated men have lower completed cohort fertility and higher childlessness than medium and highly educated men. These disparities persist across cohorts. To give an example, Figure 4 shows the childlessness levels by education for men in the four countries. The levels among men with only basic education in the most recent cohorts are striking (Figure 4). More than a third of low-educated men born in 1965–69 in Denmark and Finland and more than a quarter of those born in Norway and Sweden over the same period were childless at age 45. In contrast to men, women’s educational fertility differentials have changed substantially in the Nordic countries. The oldest female cohorts display the pattern that is commonly reported in the literature, with the lowest educated women having the highest completed fertility, and the highly educated women, the lowest. 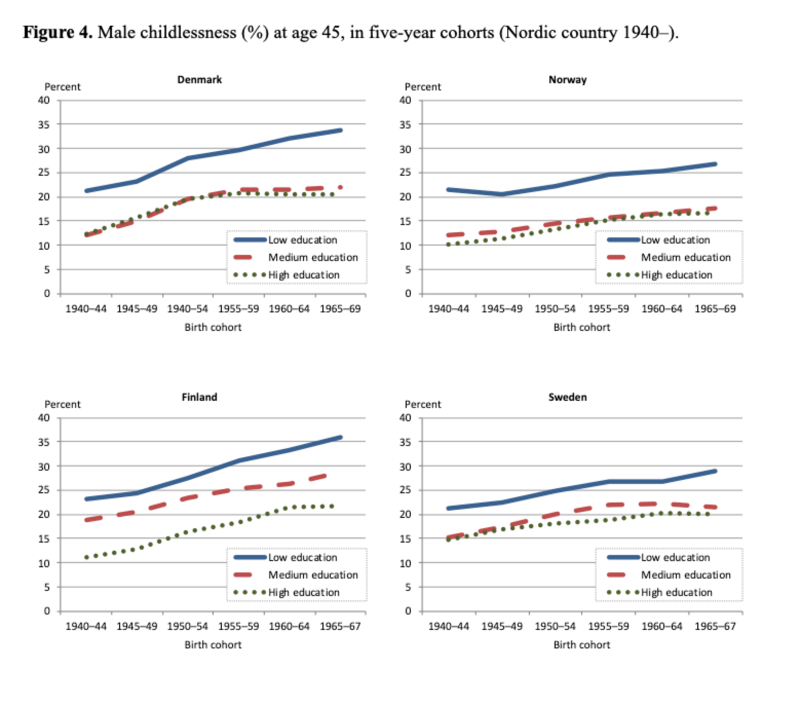 In Denmark, Norway, and Sweden, a remarkable convergence has occurred across cohorts and the differences between educational segments have practically disappeared. In women’s childlessness, we observed an intriguing change in educational disparities (Figure 5). Among women in the oldest cohorts in all four countries, childlessness is clearly highest among the highly educated. However, childlessness among low-educated women has increased almost continually, while levels among medium and highly educated women have plateaued. As a result, the patterns have changed entirely across the cohorts: in the most recent female cohorts, childlessness levels are highest among the least educated. In sum, we find persistent (among men) and new (among women) educational disparities in childbearing in the Nordic region. The developments in women’s and men’s educational fertility differentials have brought about a new pattern of gender similarity in the Nordic region. While in the oldest cohorts, childlessness levels were highest for low-educated men and high-educated women, in the recent cohorts, childlessness is highest for the low educated regardless of gender. An often-presented argument is that, owing to their greater earning potential, highly educated women have higher opportunity costs and therefore lower probabilities of childbearing than low-educated women. This is clearly not in line with the Nordic patterns. One possibility is that the Nordic countries have succeeded in reducing opportunity costs by institutionally supporting the work-life balance through, for example, affordable, high-quality day care for children and gender-egalitarian parental leave policies. What was not foreseen were the obstacles to family formation for women and men with a low educational level. The fertility behaviour of the youngest cohorts may well indicate that social inequality is intensifying in that lower educated persons, of both genders, are increasingly left behind in family formation. This, of course, goes hand in hand with the rapidly shrinking sizes of the low educated strata in these countries. 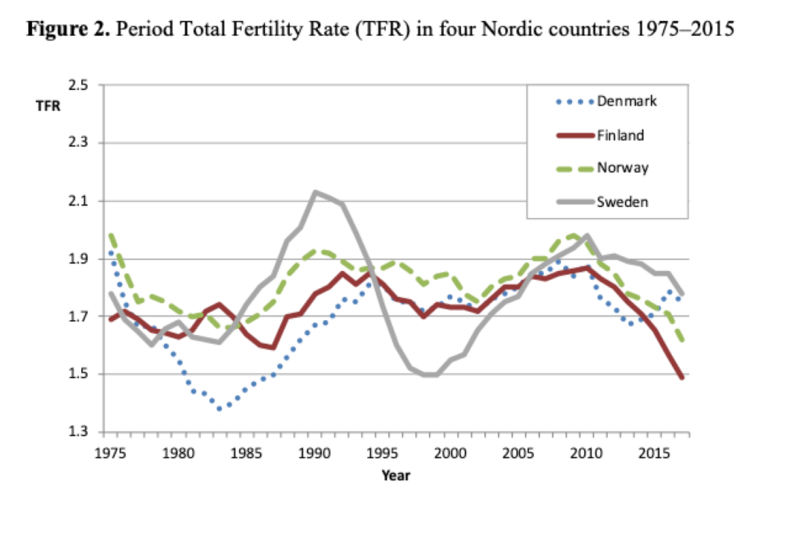 Other research suggests that the convergences and reversals we find in women’s education and fertility patterns are unique to the Nordic countries. In other European countries, childlessness levels are still highest for highly educated women and low-educated women continue to have the highest fertility (see Neyer et al. 2017; Sobotka et al. 2017). Thus, recent Nordic developments challenge established knowledge on socioeconomic fertility differentials and mechanisms of family formation. The Nordic countries are often seen as forerunners of family change and advances in social and gender equality (Goldscheider et al. 2015). The future will tell if these countries are also pioneering a more comprehensive gender, education and fertility transition across developed societies. Goldscheider, F, Bernhardt, E, & Lappegård, T (2015). The gender revolution: A framework for understanding changing family and demographic behavior. Population and Development Review, 41(2), 207–239. Neyer G, Hoem JM & Andersson G (2017). Education and childlessness: The influence of educational field and educational level on childlessness among Swedish and Austrian women. In Childlessness in Europe: Contexts, Causes, and Consequences. Springer, Cham. Pp. 183–207. Sobotka T, Beaujouan E & Van Bavel J (2017). Introduction: education and fertility in low-fertility settings. Vienna Yearbook of Population Research, 2017(15), 1–16.